In February of last year, the U.S. Department of Agriculture’s (USDA) Animal and Plant Health Inspection Service (APHIS) officially announced the discovery of a Nor98-like scrapie case in a ewe from a flock in Wyoming. This was the first case of scrapie consistent with Nor98 discovered in the United States. Since then, four more cases have been discovered that originated from flocks in Colorado, Indiana, Minnesota and California. These cases are not related to either the first one in Wyoming or to each other. This scrapie type was first found in Norway in 1998 and has since been found in sheep and goats in many countries in Europe. This type of scrapie affects sheep of all commonly occurring genotypes including those that are resistant to classical scrapie. According to Sutton, those flocks in the United States that are found to be infected with Nor98-like scrapie will not be able to use the current genetic-base approach to flock clean up. Producers whose flocks have risk factors for classical scrapie are still encouraged to test at codon 171 for classical scrapie resistance, as has been done in the past. The World Organization for Animal Health (OIE) has formed an ad hoc committee to consider how to address Nor98-like scrapie with respect to trade. It will likely be at least two years before a code change could be made should a consensus be reached. According to Linda Detwiler, DVM, assistant director, Center for Public and Corporate Veterinary Medicine, it is important to note that it isn’t known if the appearance of non-classical scrapie cases in Europe and the United States are more likely due to the increased ability to test for and detect non-classical scrapie than to increasing rates of infection. Scientists in European countries are beginning to look at archived samples in an attempt to identify non-classical cases that may have occurred earlier than 1998. “I would caution everyone that it’s premature to be able to say much of anything about these non- classical cases. At this point in time, there are many unknowns such as: 1) is there more than one strain, 2) what is the origin, 3) are there natural modes of transmission, 4) does the genotype affect incubation time and clinical presentation, 5) do codons other than 136, 141, 154 and 171 influence these cases and 6) how long have these cases been occurring?” she questions. Because of Europe’s increased awareness of non-classical scrapie, there has been quite a bit of research into understanding how and if the disease is transmitted and how it affects sheep. Research is currently underway in the United States. “The first U.S. material became available in February, so ARS (Agricultural Research Service) is gearing up to study it. But, because of the nature and long-term aspects of the disease, it will take a while to study, so we will probably be seeing research from Europe published first,” Sutton adds. In the meantime, it is stressed that officials will continue to handle the disease as it has in the past, and that producers should be aware of Nor98-like scrapie but not alarmed. “We are going to treat it as scrapie until the international community removes it as a trade barrier or science finds that there is a better way to handle it than the current system,” Sutton says. Jim Logan’s, DVM, chair of ASI’s Animal Health Committee, best advice to producers to protect their flock from Nor98-like scrapie is to maintain a closed ewe flock. He says that to prevent the introduction of all scrapie types, producers need to be aware of where new purchases are coming from, know the genetics of new purchases and avoid purchasing ewes unless familiar with the scrapie status of the farm of origin or maintain a closed ewe flock. “Essentially, people need to use common sense and maintain good sanitation and husbandry practices,”he explains. Nor98 is a relatively common prion disease or transmissible spongiform encephalopathy of sheep. The first descriptions of the disorder were in sheep diagnosed in 1998 in Norway, although a retrospective study has revealed a case in England in 1989. Improved methods for diagnostic testing were published in 2002 and surveillance was initiated in many European countries. Most cases are identified in clinically normal sheep tested in routine slaughter surveillance. The disease is experimentally transmissible to sheep and genetically altered mice by inoculation into their brains but no data are yet available on whether the disease is transmitted between sheep in an affected flock. Most cases have been discovered in clinically normal sheep tested at slaughter. Of the few clinical cases, a common sign is progressive incoordination (ataxia), occurring most likely because the abnormal prions accumulate in the cerebellum, the region of the brain (the cerebellum) that integrates information coming in from the senses with nerve impulses going to the muscles. Both classical scrapie and Nor98-like scrapie are characterized by accumulation of abnormal prion proteins. However, the distribution of the prion proteins differ. In classical scrapie, prions are usually found earliest in the lymph nodes and later in the region of the brain associated with innervation of the gut. As discussed above, abnormal prions are found in different areas of the brain in cases of Nor98. Further, prion proteins are not found in the lymph nodes of sheep with Nor98 and the current live animal tests of lymphoid tissues are not suitable. Nor98 is a challenging diagnosis but skilled pathologists, working with a panel of three different diagnostic tests, can accurately diagnose the disease in the brain of affected sheep. Susceptibility to classical scrapie is associated with naturally occurring differences in the gene for the prion protein, particularly differences at position 136 and 171. Each sheep has two copies of this gene and commercially available genotype tests show the differences at those positions. Sheep with the genotypes 136VV 171QQ and 136AV 171QQ are very susceptible to classical scrapie strains. Sheep with the 136AA 171QQ genotype are susceptible to the most common classical scrapie strain in the United States and represent the most common genotype found in U.S. scrapie cases. Sheep with at least one copy of the gene 136A 171R are generally resistant to the more common type of classical scrapie. Although no genotype is considered to be resistant to Nor98-like scrapie, the disorder is found most frequently in sheep with changes in positions 141 and/or 154. The genetic signature AFRQ indicates a sheep with 136A and 171Q with the additional change to “F” at 141. The signature AHQ indicates a sheep with 136A and 171Q with a change to “H” at position 154. A large survey of 4,000 sheep in Europe and numerous reports on smaller study populations has demonstrated that sheep with either the AFRQ or the AHQ gene were eight to 15 times more likely to be diagnosed with Nor98-like scrapie than were sheep with the most common genotype ARQ. Sheep with both changes were more than 20 times more likely to be diagnosed with Nor98-like scrapie. Sheep with the 171R form of the gene are generally resistant to classical scrapie but are susceptible to Nor98-like scrapie, particularly in 171QR sheep that have an AFRQ gene. Classical scrapie is usually found in more than one sheep in a flock, with prevalence as high as 30 percent with some scrapie strains. In contrast, more than one sheep with Nor98-like scrapie is usually found only in flocks of more than 500 sheep. In addition to genotype, age appears to represent a significant risk factor for Nor98-like scrapie. 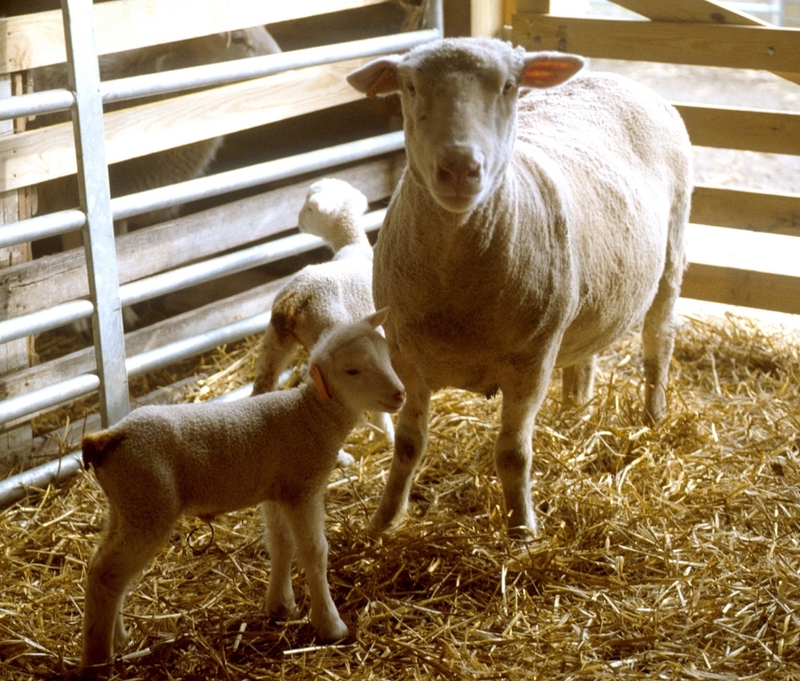 In the large European study, 80 percent of the cases of classical scrapie were found in sheep ages 3-5, a finding similar to that reported in the US. In contrast, more than 60 percent of the sheep with Nor98-like scrapie were older than five years and more than 25 percent were more than 10 years old. Nor98 is found in most countries performing large-scale surveillance; the disorder occurs at a rate of approximately one in 1,400 mature sheep at slaughter even if the rate of classical scrapie is very low. The low prevalence of Nor98 within flocks, the wide geographic distribution of the disorder, the range in age of onset or diagnosis, and the genetic factors increasing the risk of Nor98 are strikingly different than those found in classical scrapie. There may be additional genetic factors influencing development of this disorder, in addition to factors such as route of infection or age at which sheep are infected. Alternatively, Nor98 may be a sporadic disease of sheep, appearing primarily but not exclusively in older sheep. Additional findings from experimental studies and large scale surveillance using improved diagnostic methods will be useful in understanding this wide-spread prion disease of sheep. Posted by Braden Campbell at 6:44pm August 23, 2017 Posted in Health and tagged Health. Bookmark the permalink.